Introducing the Casper & Coal Signature Canvas Cosmetic and Travel Bag! We set out with one mission in mind-to craft the ultimate cosmetic bag: one that can easily fit all of our necessities without sacrificing style. Size was of utmost importance, being able to comfortably furnish our hairbrush, toothbrush, deodorant, makeup, and shampoo and conditioner should not be a privilege but a necessity for on-the-go individuals. Usually, we would just store those items in a ziplock bag when we traveled, but why would we bother with that hassle? Shouldn't it all be in one place? 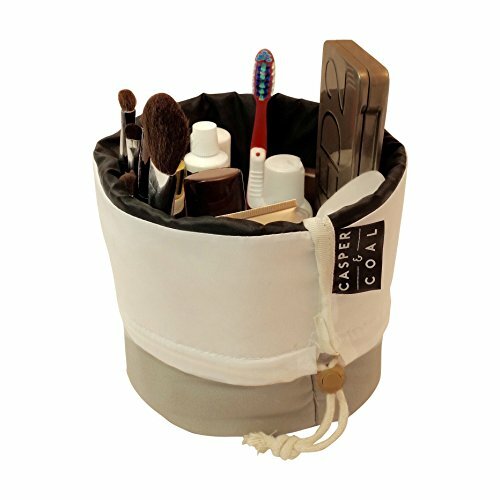 The Casper and Coal Cosmetic Travel Bag is designed to hold your products upright, avoiding spills and leaks, and securing your products beautifully in view. Forget the zippers-we opted for a sleek drawstring for an easier open and close, ensuring that your products stay secure and leak resistant with the smooth nylon interior. The exterior is crafted from high quality canvas that has been made flexible and soft to the touch so that you won't have to sacrifice style for function. Forget the zippers. This hassle-free drawstring design allows you to pack your items efficiently and with style. Built from high-quality canvas and nylon for a durable yet soft-to-the-touch feel. Machine washable and easy to clean. Stands 9" tall x 6.7" wide. If you have any questions about this product by Casper and Coal, contact us by completing and submitting the form below. If you are looking for a specif part number, please include it with your message.